I'd have to have been super starved though... 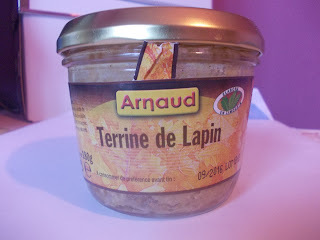 This is rabbit paté. It was not a hit with the friends we shared it with... Nor was the wild boar paté we presented at the same time. You've got to really have a taste for this; some do, and some really don't. I'm squarely in that latter category. You can just imagine that inaugural visit to my future in-laws' when suddenly the table went silent, forks ceased clinking and glasses were set down, as the group drew its gaze toward me to witness my first sampling of fois gras. Then <gulp> I had to tell them that "Non," I didn't like it. But sixteen years later, they're still accepting me and we've come to some understandings. In exchange for not serving me lots of gamey meats, I don't offer them things made with beurre de cacahuète, a.k.a. peanut butter.